Dr Alfred Baumgartner and his colleagues at The Bergkelder developed the original Grünberger in 1953. It was inspired by the famous German wines from the Rhine Valley, an area rich in romanticism and mythology. 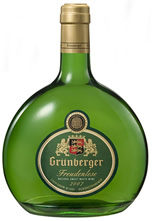 The clearly identifiable rounded shape of our "bocksbeutel" sets Grünberger apart from all other wines. 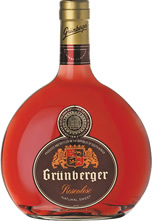 Grünberger was positioned as the Prince of Wines and with its intense flavours and enchanting aromas it has the unique ability to excite the senses. The wine has a beautiful coral colour with pronounced raspberry and strawberry flavours underlined by a lively honey blossom bouquet. On the palate it has vibrant strawberry fruits supported by a glowing spicy background and a long lasting aftertaste. 80% Sauvignon Blanc and 20% Ruby Cabernet blend The Sauvignon Blanc grapes came from vineyards in the Stellenbosch and Durbanville areas, planted at 180 to 245 metres above sea level. The vines weere planted from 1983 to 1989 in deep, red Hutton with a clay subsoil as well as loamy soils originating from granite. The vines are low trellised and were planted from 1984 to 1985 in soils consisting of mainly Malmesbury shale with stone. The wine has pronounced spicy and clove flavours with undertones of dried fruit. The Sauvignon Blanc grapes came from vineyards in the Stellenbosch and Malmesbury areas, situated at 180 to 240 metres above sea level. The vines were trellised and were planted between 1984 and 1989. The Gewurztraminer grapes came from vineyards in the Durbanville and Stellenbosch areas, planted at 95 to 180 metres above sea level. The trellised vines were planted from 1984 to 1986. On the nose the wine has lively and exotic fruit flavours complemented by green apple and delicate muscat aromas. On the palate it is well balanced and off-dry with vibrant tropical flavours supported by sparkling Muscat flavours.